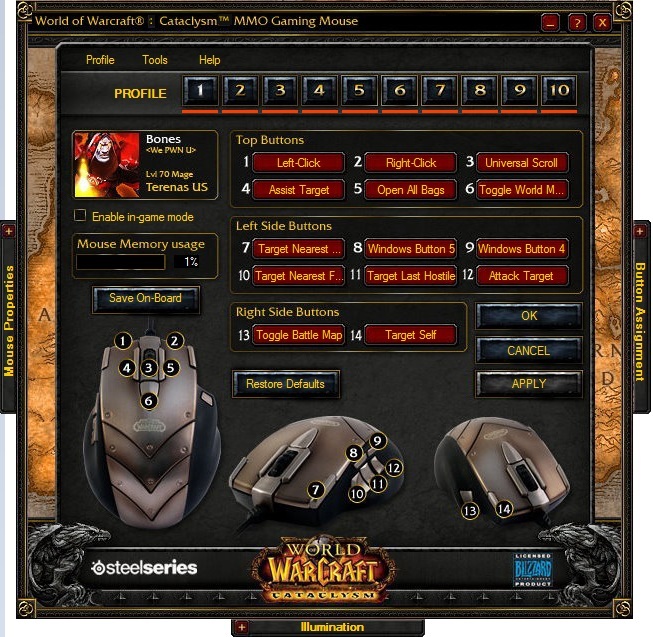 Many of those of you who have the World of Warcraft Cataclysm MMO Gaming Mouse, from SteelSeries, have failed to use the mouse with other games other than World of Warcraft. You can use the mouse with other games but usually you are limited to 5 buttons : left click, right click, middle click, and mouse wheel up / down. I’ve spent of few hours trying to make the other buttons of mouse to work with World of Tanks, and I have found an easy solution. First I’ve tried assigning different macros for the other buttons but it didn’t work. However the macros work in Windows applications. I’ve tried all types of macros : Copy&Paste (Driver only), Text (with Auto Delay), Record Delay and No Delay. None of these macros worked inside the World of Tanks game. I’ve noticed that with the default profiles the mouse has, the button placed before the wheel (named Button 6), toggle the mini-map in World of Tanks. The mini-map is associated with the key M. The key’s default function is named Toggle World Map Pane in the SteelSeries Mouse application. The highlited line is what we are after. The first 3 buttons are the left click, right click and universal scroll. We are interested by the corresponding values for the buttons from 4 to 14. Remember that i’ve said that BUTTON 6 toggles the mini-map in World of Tanks same way of pressing the m key ? Well, the value in the XML file for BUTTON 6 is 517. If we modify this value with another number, we can assign almost any key to the SteelSeries World of Warcraft Cataclysm MMO Gaming Mouse. If we would know what values need to be filled in, we could then import the profile in the SteelSeries mouse app (the modified XML file) and use it. 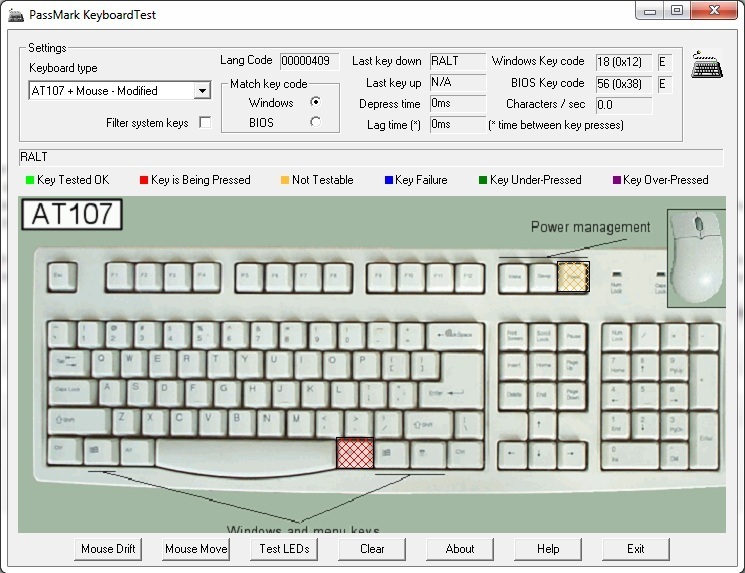 To discover the keys i’ve used a little program named Keyboard Test by Passmark software. It has a trial period of 30 days. This program helped me to discover the corresponding keys for different values, assigned in the XML file. Just download / install / launch Keyboard Test, then press different buttons of your mouse. It will tell you what keys or combination of keys is triggered when different mouse buttons are pressed. Remember after testing a mouse button, to use the Clear button of the Keyboard Test app. Using the program above with different values for Button 6 of the mouse I’ve made a list of the keys found and their corresponding values that must be used in the XML profile file. For example 405 is F1, and 415 is g.
So the trick is to set the appropriate values for each button we are interested in. I’am currently using value of 405 for mouse Button 6 which corresponds to the key F2 – Targeting enemy. For the Button 4 i am using the value 304 which corresponds to the key 4 – Repair tracks. For the Button 5 i am using the value 305 which corresponds to the key 5 – Heal crew member. For the Button 12 i am using the value 409 which corresponds to the key F5 – Affirmative chat command. For the Button 13 i am using the value 306 which corresponds to the key 6 – Fire extinguisher. Below there is a PDF file with the values that i found. You need to use the CODE column, not Windows Key Code or Bios Key Code ! You can get the SteelSeries software from here (local download). Hey, thanks for this post, it turned out to be really helpful due to the asinine way Steelseries implemented middle click. Basically, the “universal scroll” option available in the program is not really the same as middle click. In many games it does work as middle click, but also causes the camera to spin to the side and up or down, again when releasing the button. But the middle click @ code 101 works fine. You might want to edit the PDF and change the function for key code 3 to middle click/universal scroll or something, since it causes problems in many games, and leave key code 101 as the real middle button. why, when I’am on PassMark keybind program, i can click whatever button, clear everyhtinme before and after, the Lang code is never changing… it’s always : 00001009 ? Yeah, but I don’t understand, if I want to change the values of my mouse, wich code do I put ? Because your numbers are all in the 4**, and bios or windows key are under 100 ? Let’s say you want to change the Button 6 of the mouse, the one under the scroll. You need to export the profile, and edit the resulting XML file. You want to assign the SPACE key to Button 6. So you open the PDF file, search the SPACE key, and note the corresponding value on the CODE column : 519 (for SPACE). So edit the field in the XML file for button 6, and use 519. Import the XML file and you are done. I’ve used the Keyboard Test program from PassMark when i assigned different numbers (from 1 to 1000) to a mouse button, in the XML file, and tested what key was triggered. Let me know what how it works. TY, it worked perfectly, sorry its because, in fact I wanted to bind “alt” or “shift” key to a mouse button so I could get so much more key from my mouse !! Ex: mouse button 4 = alt, then by pressing 4 and exemple 7 It would reslut in ALT+f1… but I dont think its possible 😛 would have been really nice !! If the mouse knows to send the commands from two buttons simultaneously, it should work. But if you are using the mouse in Windows, macros should be enough. There may be a third option, to configure the mouse directly from World of Warcraft, but I am not going to install it just to test that. I’ve installed WOW to test the mouse functions and it doesn’t work like I imagined. It only lets you to bind mouse buttons 4 to 15 to any action available in the key bindings panel. So WOW will recognize any button of the mouse, without the need to assign C for “chat” (code 501) to a button with my method. it works, thanks. Have you found the code for ctrl c? I don’t think you can have ALT or SHIFT on a mouse button, but you can have combinations like : CTRL + 1 (code 335) or SHIFT + 2 (code 346). I’ll update the table soon with new values. What keyboard button to which mouse button ? Export the profile of the mouse, open it with Notepad. Go to the end of the file. Download the PDF file, search the corresponding value in the first column and modify the profile file. Glad to share my tests. You want the X letter or the combination for closing windows : ALT + F4 ? I would like to use X button on WOW mouse button 3. I need more corresponding key list that you ve shared. I havent used in game now but in an hour. Thanks so much for that PDF. You just breathed new life into my old mouse. If you don’t mind me asking, how old is your mouse? Does it look the same like in day 1? I want to know if the exterior material started peeling of or not. I just wanted to ask you, for how long do you have this mouse? Did the exterior material start to peal off in time (mainly due to sweaty hands)? I have its predecessor, the Ikari MMO, and it looks horrible now because of this issue. I want to try my luck with the Cataclysm, but don’t want to end up with the same issue. I would really appreciate a reply from you. Summary of the article : Export the profile to a file and edit that file. Then import it again. I’m having the same issue. I can edit the XML file, and it changes the TEXT of the buttons in the app, but the button functions aren’t changing at all. I basically changed every single button to “scroll wheel” just to see if any buttons at all were working, but it seems like something else is owning the functions of the mouse keys. Any other ideas? Try to disable “Enable in-game mode” from the app, or select another profile. Also check app and driver version. Thank you for this article. I grabbed one of these mice without realizing the extent of the driver issues (I thought I’d just make macros for all the commands I needed, not knowing they wouldn’t work in-game). Is the PDF complete? I’m surprised at the limited set of keys the driver will accept. Really disappointing. Personally, I find the Cataclysm to be ergonomically perfect. It’s exactly what I’ve always looked for in a mouse… only to find that the drivers are nearly unusable. I’m using this mouse not for gaming but in the office. I used to have there recoreded macro for excell’s extend selection – CTRL SHIFT END, but I have accidentaly deleted that and now I can’t make it work again. Can anyone advise how to make it work again, please? but where I’m lost is the third value. It seems like a time in ms. But I cant figure out if this represents for how long it is pressed or the delay after previous key or delay from the beginning etc. I guess the key to making it pressing all 3 buttons at once is with the timing. I have fixed the issue with all wow mice, easy fix. To make the custom macros work with any game with any of the mice. Simply add the *.exe to allow it to use for the program. Here is the kicker. dont add the games *.exe…. nonono… add in explorer.exe and now the buttons work in any game as long as you set the custom macros to keyboard. Open up your mouse software, now i use a WoW Legendary Edition Mouse, but im sure its the same way with yours. But here is how you get all mouse buttons to work for any game software, etc. Now when your here dont add in the game or app your trying to bind to. Instead just add the explorer.exe. Now click apply, and click the button you want to bind a macro to, it should bring up button assignment or you can click it your self. goto custom macro and once there do a new macro and select No delay, after that click top box and name it whatever, then click the bigger box then press the key you want bound. Now if you did this without a mouse button selected just drag and drop the macro on the button you want it to be at, otherwise repeat steps above to add more macros to different buttons. After your done, just click apply. BAM works on everything! Years later and this thread its still useful, it even works with the oldest wow mmo gaming legacy mouse, thank you! I am wanting to be able to change the way the button functions when pressed…I’d like that it would keep pressing the macro so long as the button is held down, much like a key on a keyboard would if you just held the wwwwwwwwwwwwwwwww key for a few seconds. Is this possible through the method you described? or do you have an idea of where better to look to find the code for it?